A recipe without a book to be written in. 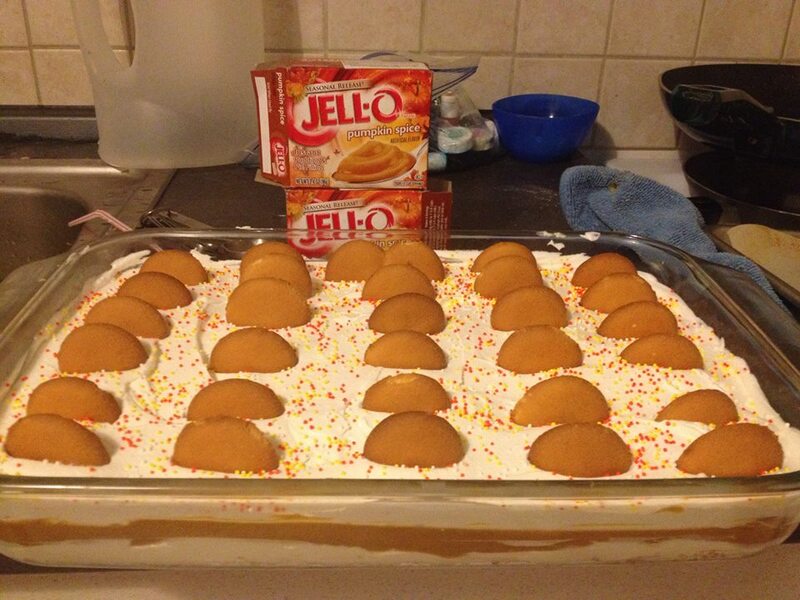 I have had Pumpkin Spice Jello Pudding in my pantry for awhile. My mom sent it to me. She sends me things she thinks I would find interesting. Hence the Pumpkin Spice, Gingerbread, and Peppermint Pudding mixes I have in my pantry. I have been wracking my mind trying to find something to use them with. When I was visiting my husbands family I did not get my Chocolate Delight, which is usually made at least once while I am there for various functions going on. My thought was why can’t I just switch the chocolate pudding for one of the puddings above. This is when my Recipe for Pumpkin Delight was born. 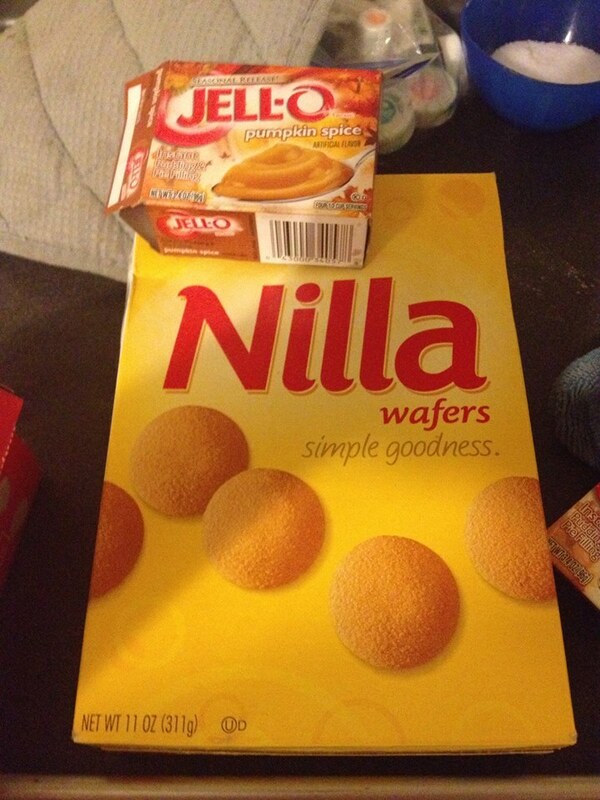 I used a Nilla Wafer Crust, You can probably use just about any flavor combination you like. This was a huge hit at Halloween Bowling and was gone in about 15 minutes, once people noticed there was dessert. 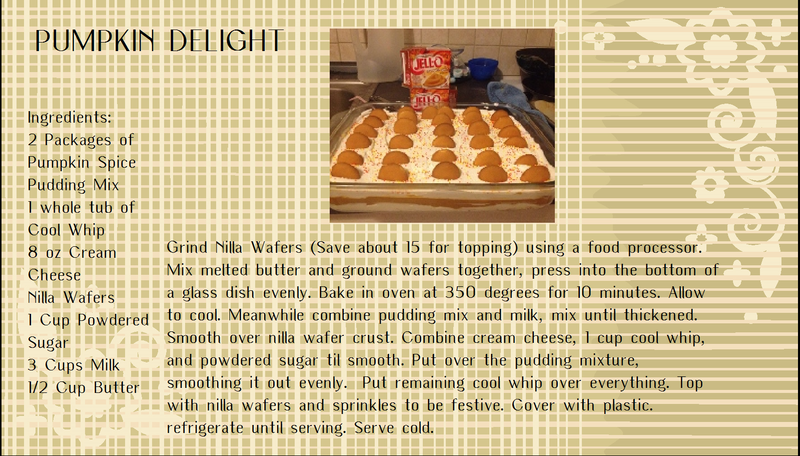 This is truly a great recipe, you can switch out jellos and play with it a bit. Still trying to figure out something to go with the peppermint. I’m not going to spend anytime explaining this recipe. It’s the basics of all basics. If you have ever made instant pudding, you have this in the bag. Make it Festive and Enjoy! Alaska in the early Spring #sunshine #alaska #fairbanks #2019 A balmy 52°F.